We had a wonderful holiday here. It went by too fast, as it always seems to. Thanks again for all your good ideas regarding the wheelchair ramp for Mom. We ended up renting a chair with big wheels (she uses a smaller wheel transport chair at home) and then we put the muscles to the test, step by step. It was easier than we thought. And so important and delightful having her with us at the table! Now I'm scrambling trying to get work together for tomorrow's event sale at Pretty Funny. It's a big night party and I'm hoping some of you plan to stop by. Silver Bella pretty much cleaned me out so I have been busy at the worktable ever since. And of course, I want to have some things (kits and cottages) for Etsy and you! 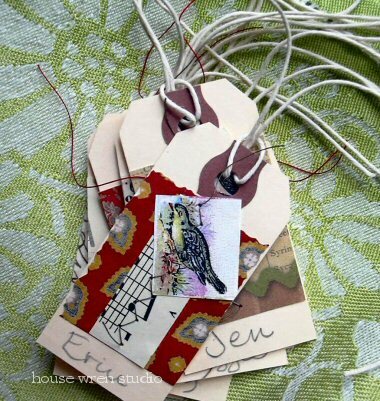 Other BIG news- save the date for the next house wren studio sessions class - January 23! So excited to be planning another fun day at the craft table with you. Scrolling through photos and files I found this image from Mothers and Daughters at Home. That was so, so long ago, but I still remember shooting that little scene when we lived in the warehouse loft in - what year was that, '98? It sends me back to that sunny, happy day, back to the wool stack, back to a never-fail inspiration. Doesn't matter what year it was. Could have been yesterday. Mo is home for the holiday! Everything has a new sparkle here even though it's so gray out. Looking ahead to this busy time of year and also still thinking about the great time we had in Omaha. In and out of the classroom. Love my sweet art friends! Denise, baby Claude ....where was Jennifer? She had to be veeeeery close by. Inspiration. Friends. Family. You. Grateful. Silver Bella was as much fun as ever this year - in and out of class. My first day of teaching was 2 sessions of the Hat Class. I will admit that I was worried that the project - making a hat from an upcycled felted sweater - was too funky, too experimental. Never fear, the brave ones are here! I was so thrilled to see them cut into those washed and worn sweaters and reinvent the materials to make the cutest and coolest hats! And then wear them with enormous pride- throughout the day. And again the next. Inside the hotel, outside shopping and dining in Omaha. They shared scraps, trims, skills so generously. A few decided to make the sweater tote bag from an extra option I brought (at the last panicked minute of packing). Darling! They decorated their hats with such clever, individual style. They shared techniques like ruching seam binding. It was wonderful to see their delight. I felt like a proud mama. So many of the students said they felt as though they had discovered a whole new craft. Some said they were sewing for the very first time - and loving it! What more could a teacher hope for? The wind kicked up off the river the other day prompting me to think about making another version of the hat - for me and for class. Some folks are going to bring those Daddy-sized shetland wool crew neck sweaters. I love those because they give lots of felted fabric and the colors are always so rich. I think I have a shell pink Ralph Lauren one with cables. Popped collars and Palm Beach! Anyway, this is what we can make out of those. A bit more refined than the other model and decorated with some of my cherished covered buttons. I like this one and expect I'm going to wear it alot. Except that would mean I'd have to take off my Yankees hat! No time soon.